Options | Outgoing Mail - use Custom Routing Table option. Mailtraq evaluates each message against the routes entered into this table from top to bottom. A message may match the specification of more than one route, therefore, but Mailtraq will always attempt delivery using the first matching route found only. Filters can also be employed to further refine the route chosen by Mailtraq for the delivery of outbound mail. Some ISPs require connection to specified ports and also might require that you 'Authenticate. The Static Route supports SSL/TLS in both Explicit (STARTTLS) and Implicit modes. 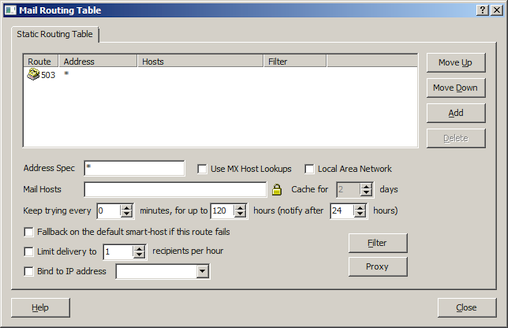 If you are using STARTTLS you must enable 'Advanced Outbound Router'. Position the new entry (if there are existing entries in the list box) by clicking repeatedly on Move Up or Move Down as required. The following details should be entered into the Static Routing Table Tab, which appears on the Mail Routing Table dialog. Filters are also available to further refine the route selected by Mailtraq for delivering outbound mail. This edit box contains the address specification against which Mailtraq tests each item of outbound mail. The default entry of "*" (an asterisk) matches the address of all outbound messages. An entry of "example.com" (without quotes) matches messages addressed to any user at the example.com domain. If this checkbox is checked/ticked, Mailtraq will use MX Resolution to deliver outbound mail which matches the Address Spec. The Mail Hosts field changes name automatically to DNS Machines when the MX checkbox is ticked. If the outbound mail is addressed to a user on an attached local network this checkbox should be ticked and Mailtraq will deliver matching outbound messages immediately or in accordance with the Synchronised Online Times if that option is selected in the Online Tab. If the MX Host Lookups checkbox is unchecked, this field is named Mail Hosts and the name of an Internet Service Provider's mail server or smart host, usually in the form of "post.domain.com" (without the quotes), should be entered. Multiple Mail Hosts may be entered in the edit box, with each entry separated by a comma. If a TCP/IP port other than the standard SMTP port must be accessed on the remote mail host, the port number should be appended to the mail host with a delimiting colon in the form of "post.domain.com:5005" (without the quotes). If authentication is required with the specified Mail Hosts, this can be configured via the padlock icon. If the MX Host Lookups checkbox is ticked, this field is named DNS Machines and the names of suitable machines should be entered. If more than one machine is available, multiple machines may be entered, separated using commas. The correct names of DNS Machines to use are normally specified by an Internet Service Provider. This field is available only if the Use MX Host Lookups field is checked. Mailtraq places MX Resolution results in the Dynamic Routing Table (MX Cache) and this field determines how long Mailtraq continues to use that information before performing another lookup. The default value for this field is 2 days. The setting in this edit box determines the amount of time that Mailtraq waits between outbound mail delivery attempts. The default value for this field is 60 minutes. This setting, in conjunction with the Keep trying every... field, determines the number of delivery retries that Mailtraq will make. The default value for this field is 96 hours. Mailtraq uses the delivery_delay.tpl template to inform the sender that their outbound mail has been delayed after the number of hours specified in this field. The default value for the field is 24 hours. If Mailtraq fails to deliver matching outbound mail via the specified Mail Hosts, the mail is delivered to the Remote Server (as specified on the Remote Mail Server tab of the Outbox Properties dialog) if this checkbox is enabled. This option should not be enabled if mail delivery is being effected via MX Lookup on a route because it prevents messages being queued in the outbox if the initial delivery attempt fails for a non-fatal reason. The Static Routing Table entry which Mailtraq selects for the delivery of outbound mail can be further refined by attaching a filter, or number of filters, to each route, if required. This example entry shows that Mailtraq has retrieved two mail hosts for example.com during MX Resolution with mailhost.example.com being preferred. This entry will be reused by Mailtraq for mail deliveries to example.com until the entry expires from the cache on the date and time shown in the Expiry column. The expiry time is a compromise setting which attempts to speed up mail delivery by reusing previously obtained information but which also risks that information becoming out of date which may then cause Mailtraq to deliver mail via the slower smart host route. A route can be disabled temporarily by adding a number of # characters to the front of the address specification. For example, to disable the existing route for example.com the Address Spec edit box could be altered to read "##example.com".